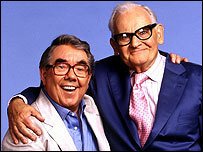 It would surely have tickled Ronnie Barker that the biggest laugh of his memorial service at Westminster Abbey was reserved for his comedy partner Ronnie Corbett. Amid the abbey's statues of the likes of 19th century prime minister Robert Peel and the poet Dryden, diminutive Corbett punctured the austere atmosphere by bringing his own crate so he could be seen behind the lectern. The 2,000-strong congregation of family, showbusiness friends and colleagues, as well as members of the public, roared with laughter. Corbett said: "It is a truly monumental task for me to encapsulate 40 years of working together with this dearest of men. "We had 40 years without an argument and only unmitigated pleasure and laughs." Corbett reeled off anecdotes about his shy but talented friend, including one which showed Barker never lost his ear for comedy. Corbett said that when Barker had visited a private hospital for a "very special cardiac examination", the comic told a porter he was worried about news of his visit leaking out. "Ronnie said the porter told him: 'Don't worry. We are very, very discreet. We had Danny La Rue in here on Thursday.'" Corbett added: "Ronnie provided us with the happiest of times. "Whatever else you could say, you could always guarantee it was going to be a very, very good night from him. God bless you, Ronnie." The Reverend Robert Wright, Sub-Dean of Westminster, who led the service, said Barker was "undoubtedly one of the very greatest television comedy actors". "As a performer, he made comedy look effortlessly funny," he said. Some of British showbusiness's most popular performers of the last 50 years made sure they were there to pay their respects. 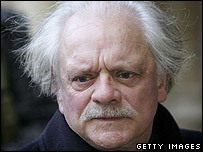 Sir David Jason, Barker's co-star in Open All Hours, was present, along with cast members from prison sitcom Porridge. 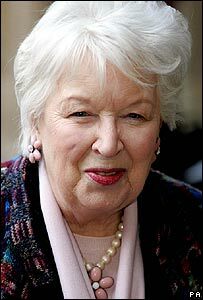 Barker's influence across the generations was shown by the presence of Stephen Fry, Python Michael Palin and sitcom mainstay June Whitfield. Meanwhile, Lenny Henry and Dawn French, both popular with the 1980s alternative crowd, sat next to Carry On actor Leslie Phillips. But it was one of the youngest stars, Peter Kay, who got to make a tribute. He recalled how he had struck up a correspondence with Barker after writing to elder statesmen of comedy just to say "how much he made me laugh". Barker replied in character as jailbird Norman Stanley Fletcher, his character in Porridge, writing from Slade prison. Kay read from his letter: "I have been keeping a clean sheet so far. But that's mostly because I work in the prison laundry.'" Actor Richard Briers read a speech from Henry V, one of Barker's favourite plays, while actress Josephine Tewson did the Bible reading from Corinthians. BBC chairman Michael Grade read an excerpt from Barker's autobiography. Barker got to have some of the final words at his own memorial service. 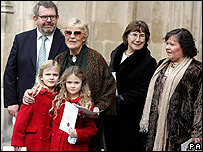 The congregation were treated to a recording of his sermon in rhyming slang, which remains as funny as it did when it was first aired in the Two Ronnies' heyday. But then a clip of an interview with Barker echoed round the grand hall. "I suppose I would like to be remembered as one of the funniest men that people have seen on television," he said. Many will have been echoing the sentiments he hoped they would express: "'He made us laugh. He did make us laugh. God bless him'."